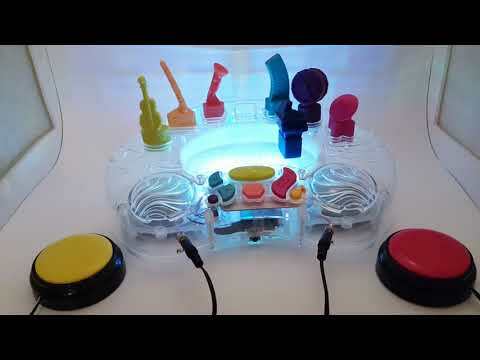 Be your own conductor with Symphony B interactive toy. Choose up to 6 of the 7 musical instruments, place them on the center stage, then press your switch or the button on the toy to hear the beautiful music from your chosen instruments and see the lights. This toy can be used by non-disabled peers but it has also been switch adapted with a 3.5mm plug to allow a standard switch to be plugged in. This allows people with disabilities to control the music. Press your switch once to start the music, press it again to cycle through the 15 songs. Press your second switch (optional) to stop the music. Switches are sold separately. This toy is wonderful to encourage cooperative play, provide auditory and visual stimulation, and enhance language skills. Includes auto-off to save batteries. Dimensions: 13 x 9 x 3.75. Includes 6 AA batteries. For ages 3 and up. Switch sold separately. Use with caution in seizure prone individuals.